From the second half of next year, new foreign workers will attend a mandatory Settling-In Programme (SIP), similar to that for first-time domestic workers. This is to help them learn about Singapore's social norms and laws, as well as their employment rights and obligations, Manpower Minister Lim Swee Say said yesterday. It will also inform them about how and where they can seek help. 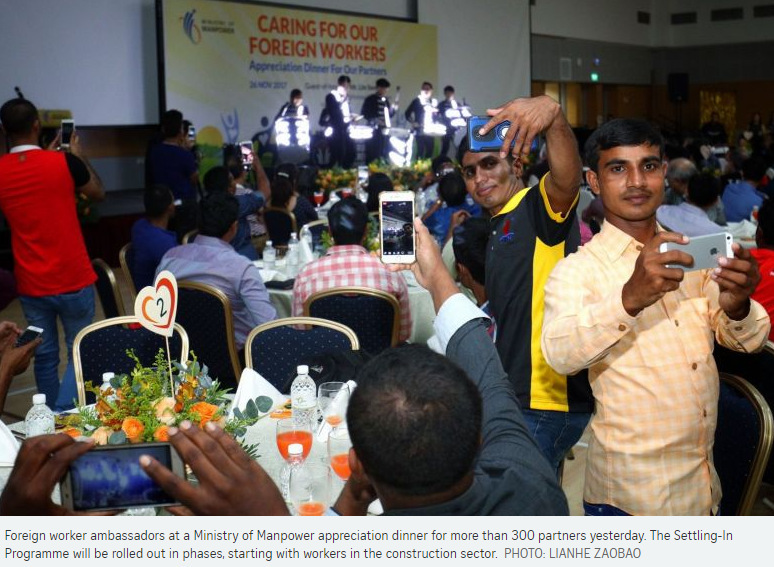 The move was welcomed by non-governmental organisations (NGOs) that help foreign workers. They said employers not paying their workers their salaries or not compensating them for work injuries continue to be an issue here. The new programme will help newcomers know what they are entitled to and where to go for help, they added. The programme, to be rolled out in phases, will start with first-time foreign workers in the construction sector, Mr Lim said. Malaysians will be excluded. He was speaking at a Ministry of Manpower (MOM) appreciation dinner for more than 300 partners, including employers, dormitory operators and NGOs. The SIP will be extended progressively to other sectors such as the marine, process, manufacturing and service industries. MOM said about 2,000 foreign workers in the construction sector are expected to attend the SIP each month. Employers will be responsible for registration and course fees. The ministry conducted a pilot from June to October last year involving close to 1,900 workers. Besides receiving feedback that the course was useful and helped workers understand how MOM can help with employment issues, a post-course evaluation found that the workers showed a more positive work attitude after the course. Singapore has around one million work permit holders, of whom about 700,000 are non-domestic foreign workers, Mr Lim said. He stressed the need to take strong action against irresponsible employers and employment agencies, adding that Singapore has strengthened its laws and policies in this area over the years. In 2011, under the Employment Agencies Act, the fine for those operating without a valid licence was raised from a maximum of $5,000 to $80,000 for first-time offenders. Last year, itemised pay slips and key employment terms in writing also became compulsory, he said. In April this year, the Tripartite Alliance for Dispute Management was set up to strengthen dispute resolution mechanisms. In the first six months since then, it received 2,500 salary claims from foreign workers. Of the cases where mediation was concluded, about 90 per cent of the workers recovered their unpaid salaries in full, said Mr Lim. "All foreign workers with valid salary claims are also allowed to change employers," he said. In the first six months of 2017, about 600 of such foreign workers indicated that they wished to change employers and, of these, about half found new jobs in Singapore, he added. In the first nine months of this year, over 99.9 per cent of 11,500 injured workers had their cases successfully resolved, he noted. The remainder were not resolved as the employers failed to buy work injury compensation insurance and were facing financial difficulties, he said. Organisations working with foreign workers said the new SIP could help to address ongoing issues that workers face. Ms Noorashikin Abdul Rahman, president of NGO Transient Workers Count Too (TWC2), said that it will be beneficial for workers to know more about local laws. "We have a steady flow of workers who come to us for help," she said. These include salary and work injury compensation issues. "A bulk of our clients are work injury compensation workers, and most of them are quite seriously injured," she added. TWC2 sees more than 1,000 new workers a year. Mr Jeffrey Chua, a social work case manager with HealthServe, said: "Many injured workers do not know what to do or who to turn to for help, and they do not expect to get injured." The NGO provides medical, legal and emotional help to migrant workers. "It's good, because it lets them know their rights... but I think this should not be a one-off programme and there could be refresher courses in the future," he added. Dormitory operations executive Veluchamy Muniapparaj, 32, who has been working in Singapore for seven years, said it is important to know where to seek help. His employer had failed to pay him half a year's salary in 2011, he said. "After I went to MOM, it was resolved in six months," he said, adding that it was a guidebook in Tamil, that he received on arrival, that taught him what to do. • Cases of overcharging by agencies dropped from 36 in 2014 to 17 this year. • In its first six months of operation, the Tripartite Alliance for Dispute Management received 2,500 salary claims from foreign workers. Unpaid salaries were recovered in full for about 90 per cent of cases that concluded mediation. • In the first half of this year, about 600 foreign workers with valid salary claims said they wanted to change employers. About half found new jobs here. • Public complaints on housing conditions have come down, from about 580 for the whole of 2014 to about 440 for the first 11 months of this year. • Around one in two foreign workers has worked here for more than five years, and about one in five, for more than 10 years.